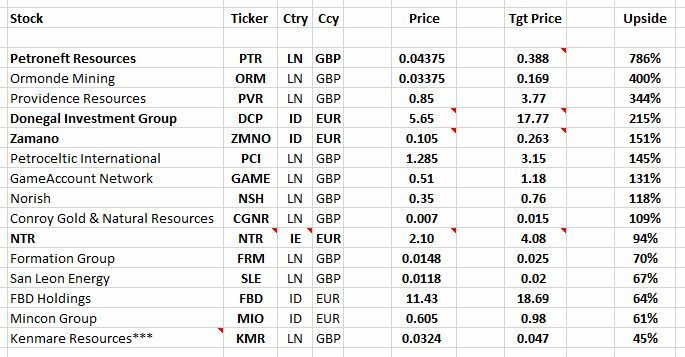 No big surprises here, these are still stocks to avoid, to sell, or even to short: We have our usual selection of junior resource no-hopers, a couple of ridiculously over-valued bank stocks (even Baldy Noonan can’t seem to warn some people off the ‘eejit trade’), my long standing bete-noire Greencore Group (GNC:LN), and a couple of biotech/medical device stocks which appear wildly over-valued (and offer precious little data to argue otherwise). Rather amazing to see this table also jammed with junior resource stocks..! [Which must infuriate my muppet critics – they’d much prefer to believe I simply hate all juniors!] But many of them are so beaten down now, they potentially represent good value – however, that’s a call on underlying asset values, it doesn’t necessarily address their risk(s) of continued negative sentiment, incompetent management, negative cash flows, and/or required/urgent funding needs. After its abandonment by Dragon Oil (DGO:LN), the market valuation of Petroceltic International (PCI:LN) is now particularly intriguing. On the other hand, Kenmare Resources (KMR:LN) remains a dodgy prospect, despite the collapse of its over-valued share price & even with a potential bidder still lurking in the wings – a debt default and/or a major dilution are now looming risks for existing shareholders. Then we have two busted IPOs – Mincon Group (MIO:ID), another casualty of declining commodity prices & sentiment, and GameAccount Network (GAME:LN)…which only has itself to blame. [GAME’s pre-IPO revenue/accounts (Jan-Oct 2013, as included in its prospectus) turned out to be extraordinarily misleading for investors when compared with subsequent revenues in Nov-Dec & H1-2014 (where revenue was down 54% yoy!?)]. FBD Holdings (FBD:ID) also feels a bit like a busted stock, at the moment – I believe its long-term investment thesis is still as attractive as ever (which should ultimately justify my original target price), but the recent collapse/disappearance of operating profitability was pretty unexpected & may continue to pressure the share price. Next we have Norish (NSH:LN) & Formation Group (FRM:LN) – both are cheap & potentially interesting micro-caps, though activism (or some other catalyst) may well be needed here to realise value. Last, and certainly not least, I’m delighted to see four (bolded) stocks I own – Petroneft Resources (PTR:LN), Donegal Investment Group (DCP:ID), Zamano (ZMNO:ID) & NTR plc. In my opinion, their prospects, valuations & margins of safety all speak for themselves…they may even represent rewarding New Year’s ‘resolutions’ to consider for your own portfolio!? Hi Wexboy, Did you get a chance to review the FBD year end report? With the share price where it is would they be a buy in your eyes even with the reduced earning forecast? Broadly speaking, I’d still expect FBD will continue to have a market-leading COR, will keep increasing market share, and can again earn a 15-20% return on equity in due course. That would suggest it will trade at 2.0-2.5 times NAV again at some point in the future, so I think it’s definitely a great long-term buy. Short-term, NAV’s declined significantly, prospective earnings/RoE outlook is pretty poor (& could get worse), we’ve no idea how idiotic competitors will be (& for how long) this time ’round, trust in management’s been dented, and the stock’s now trading under a cloud of negative sentiment (from both brokers & investors). A positive tone for the ISEQ/economy would help, but it’s still difficult to label FBD as a short-term buy or sell…after all, NAV’s now at 693 cents, so the stock’s still trading on 1.6 times NAV, which many wouldn’t view as cheap right now. Technical analysis is useful here – if EUR 10.20-40 holds, that’s good, but if the price breaks lower you could easily see EUR 9.00, or even an 8.00 handle on the stock. Like most good long-term buys, averaging-in is probably a good way to approach it.